The price is dependant on the length of time of your trip. Typical prices are 8hrs £350 full charter or £40 individual space. Yes, supply both tea, coffee & cold drinks free of charge. Additionally we also supply a hot snack such as sausage sandwich, bowl of curry or soup etc. Yes, My Way is sponsored by Pure Fishing, the worlds largest tackle manufacturer, thus the latest excellent quality rods & reels are supplied free of charge should they be required. 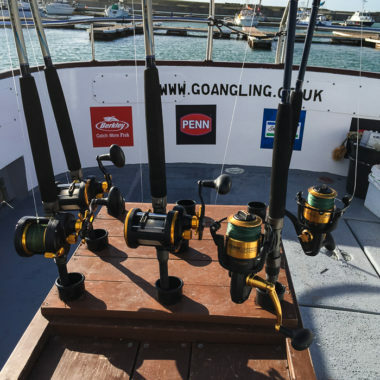 Read more on our Pure Fishing Blog. A deposit of £100 is required to secure your full charter booking, this can be paid via cheque or online for all major credit and debit cards. Balance is paid cash on the day. No, we do not allow any alcohol aboard My Way.